The Atlantic League Champion York Revolution will host the Lancaster Barnstormers on Thursday for Opening Day. Photo courtesy of York Revolution. Get Ready, York. Your 2017 Atlantic League Champion York Revolution are back. The Revs kick off their 12th season of professional baseball on April 26, the first of 71 exciting home openings at PeoplesBank Park. After finishing the first half of the 2017 season in last place, York’s home team roared back and climbed to the top of the pile last September to claim its third championship before a packed house of “Rev’d” up fans. And team officials say York’s boys of summer have no plans to give the Atlantic League trophy back. The Revolution’s 2018 schedule includes inside-the-park fireworks displays after all 12 Saturday games, three crab feasts presented by Capt. Bob’s Crabs, four trivia nights and – so far – five confirmed giveaways. The team has also announced the return of fan-favorite themes like Star Wars Night, Salute to Veterans, Swim Night, Soccer Night, Superhero Night, Princess Day, Harry Potter Night and High School Spirit Night, as well as new additions like Stranger Things Night and Made in York Day. This year will also mark the return of baseball on July 4, as the Revs host a special 5 p.m. game followed by July4York presented by York Traditions Bank, with fireworks presented by Glatfelter Insurance. Your York Revolution is not just a leader in professional baseball. It’s a pioneer in how you pay for it! 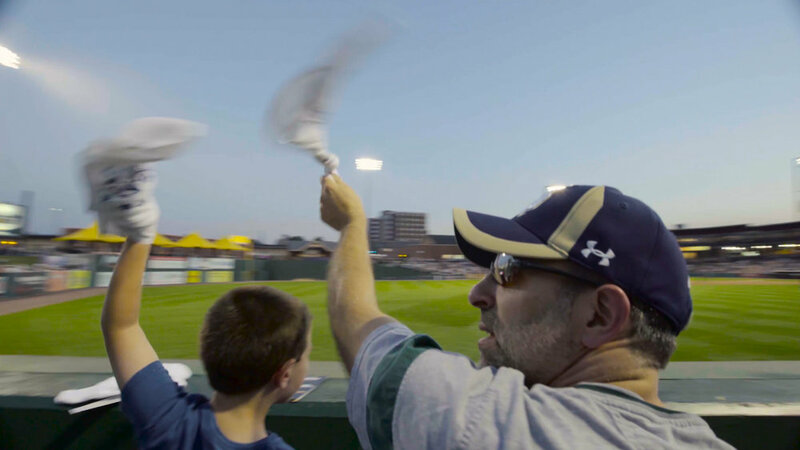 A new subscription plan will get Revs fans into the ballpark for less than $3 a game. Photo courtesy of York Revolution. Earlier this year, the team unveiled the York Revolution Ballpark Pass, an innovative new subscription plan officials say puts a ticket for every York home game right on your phone – and for less than $3 a game. Pass holders will create a logon they’ll use each day they want to attend one of team’s 71 openings in 2018. Through a fast and easy online process, they can now sign up and pay the first month’s fee of $34.79 using a credit card that will be kept on file and charged for each of the remaining five months of the season. The Ballpark Pass gives subscribers the entire season of Revolution action for $208.74 (including tax) – or just $2.94 a game. When they log on, pass holders will receive a unique bar code on their smartphones to use at the PeoplesBank Park gates. Once the bar codes are scanned, pass holders will have their choice of any available spot in the ballpark’s three general admission areas – Arch Street Eats, the outfield bench seating in DownTown’s Playground or the bench seating or lawn space in the Appell Lawn. For more information about the 2018 season, visit www.yorkrevolution.com, call 717-801-HITS, or visit the PeoplesBank Park Ticket Office at 5 Brooks Robinson Way. This story was submitted by the York Revolution and also appears in the Spring/Summer edition of Downtown York Magazine.